I am going to make it good for you today, because I am going to show you how to create a modern marketing system. And the way I explain it, and the reason I do all this stuff is I want to empower you to be able to do it yourself. Now of course you may choose to delegate it. Oh, smart move. Especially if you listened to my other podcast, but you don’t actually have to do all the work yourself but you should be able to do it what I call in house, in control, you don’t have to give it out to an agency or a marketing agency. You do not have to spend thousands on this. In America they call it bootstrapping. But you don’t have to invest the fortune, it’s just something, it’s just a system, you just have to have the elements, and they’re 6 elements so let’s get on. What that means is a website. No social media, your Facebook page, your YouTube account, these are not yours. You don’t own them. They are rented, or well actually free. But they can go away at any time. You are not in control, do, please do not make that the center of your online presence, or in fact your world presence. It’s going to be online so everyone they can see you everywhere. This is your hub. You must have one, you must be in control. My advice is that you use WordPress as a content management system, so that you can add, you can add videos, you can update old posts, you can add new posts, you can add what you’re doing, what you’ve just done. All these things, and you can add all the other stuff I’m going to say. Now very very important with WordPress, it is a little confusing, there’s 2 versions. There’s, they’re both free to get, but one is hosted for you which is wordpress.com. Do not use that. The other one, you would get a host like say in the UK, cluke or hostgater, somewhere like that. And they will be able, they’ve got a system to setup WordPress for you. It comes from the other side of WordPress called wordpress.org. Yeah, very confusing but just shoot me a message if you are confused, and I’ll explain. Never use the free ones, don’t use Google’s blogger.com. Don’t use WordPress, wordpress.com, anything else. That’s equivalent to using Facebook or something. You need to have a social media profile. Now you should be using some social media, but you don’t need to be on it all day long. However you need to claim those names. I mean, to give you an example, people do clone. There’s a company called growmap.com who on their twitter account warn everyone that their site, their entire website has been cloned by someone who has then set it up as growmap.org. If they’re out of the country very difficult to stop. Who knows what the reasons are. But it happened to them, they weren’t expecting. So people can grab your twitter handle. They can grab a Facebook name with your company name. Make sure you get them, if you’re not using them, put a message on it, in the header that says, ‘We are mostly active at twitter,’ and your twitter address, or your website or something like that. So when people look you up, they found you. They know you exist. People choose where they want to look. Not where you want them to look. Remember that. Now I’ve just been talking about this and in fact I am going to go into it in depth tomorrow. Very simply you should only be talking to the people who could potentially be a customer, or a client. It is no, you can’t do this spray and pray. This isn’t like a dartboard, you can’t just grab a handful of darts and just throw them at the dartboard with your eyes shut. You need to aim. You need to aim specifically so you need to talk in the language of the people. You need to use the words, the keywords that they use. Things like that. To give you an example, I sell fire extinguishers, we sell stainless steel fire extinguishers that are made from stainless steel and they are not painted. The customers think, because they shine, shiny and polished, the customers think they are chrome. So when I discovered that, we changed, because no one’s looking for stainless steel fire extinguishers. They are looking for chrome fire extinguishers which doesn’t exist. So we changed all the wording to be chrome and we explain. These aren’t actually chrome, they are stainless steel but that’s what comes up. Now in fact the entire industry has copied me and changed along with that because it’s so strong. They notice. But that’s an example. Use their language. You need to ask permission to market to people. 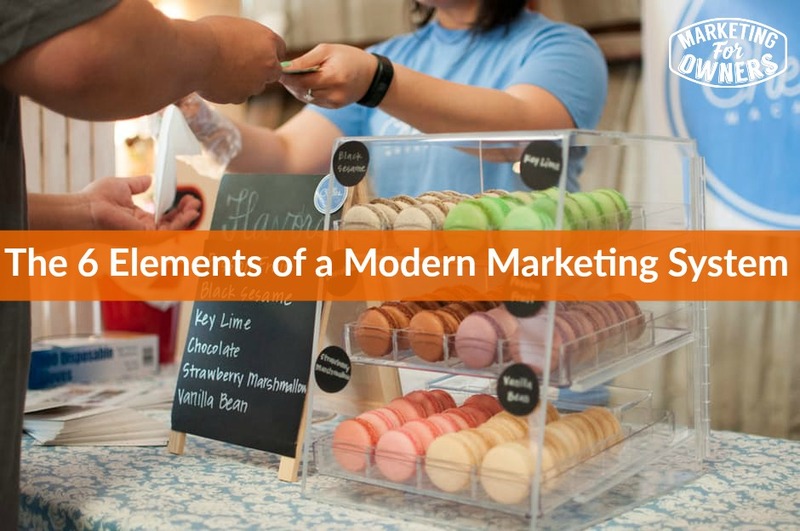 And the way we do that is by giving them something, giving your potential customers something, or offering them something in exchange for their email, and their name. You don’t need a phone number, you don’t need address, you don’t need a fax number, you don’t need to know where they heard of you. In fact you don’t even really need the name. You just need their email address. If you’re a photographer, tell them what tools you keep in your bag because a lot of people are amateur photographers and they check up on professional photographer’s sites to see how to do it. And you think, why would they become a customer, because when they want good stuff done, they are going to use an expert. Why do we watch cooking shows on TV? But we still go to restaurants. Yeah, you’re following. So permission. And by the way we call that a lead magnet, that thing. Give you further information, at a later day, and past episodes. Then we need them, once we got them on that, we will then nurture, they have become from a potential, they’ve become a lead. They have now signed up, they are a lead. So we now contact them through email marketing, and we nurture them, its lead nurturing. We offer value, value, value. We do not spam them, we do not send them messages that are irrelevant. We talk to them like they are a person, we talk to them one at a time. We don’t refer to you people, or my customers, or people like you. We refer to you. One person talking to them. They are reading it, you are talking to them. And we do that, and then we encourage them to make their first purchase through these emails, we gradually gradually, we don’t send offer after offer but we have a little way, we make them make that first purchase. Once, that’s number 5. Once they’ve become a purchaser, we then do everything in our power. Now a lot of people stop at this point. They bought it, goodbye done. Got your money. No, you’ve put all that effort in. you want them to go from becoming a purchaser to become a repeat purchaser. And then to become a regular purchaser. And to do that, you’ve got to impress them with your service. And you got to tell them. You have roughly 100 days, in those first 100 days while they remember you, when they have given you a little bit of trust. They’ve liked you, they’ve got to know you, and they’ve trusted you enough to spend money. If they are going to spend more money, they need to have that trust rewarded, so you are going to treat them as if you’ve been on a date with them and you want to see them again. You might send them flowers and I am not kidding. You might send them flowers, you might send them a box of chocolates, you might give them a gift. You are certainly going to say thank you. You’re certainly going to tell them what you think of them. You’re certainly going to ask them for their opinion of you. You’re going to ask them what else can you do, what else would you like? Would you like to go to the movies? Don’t take them to movies, you can give them a movie ticket say. But that kind of thing. And then they are going to become a preacher. Then they are going to start to tell their friends and their colleagues, and you think, say like I sell fire extinguishers and things like that. Who on earth is going to, they are not going to talk about that at dinner parties, no they are not. However they are going to at some point because they are a professional in business. If they mix with other businesses, and other professional are the same job, who have the same interest and need the same thing. They may then say, oh when someone says, where do you get your fire extinguishers? We have terrible trouble. ‘Oh you want to use my guys, you want to use fire protection online, they’re brilliant. Tell you what, I bought and then they did this. The guy, I got a box of chocolates. Guy actually phone me up. He’s the actual boss.’ Yeah, stuff like that. And then they become a preacher. And then, it has a hidden effect because then it perpetuates that is the 7th P.
I said they’re 6 elements, 6 elements but then it perpetuates because the preacher recommends people. They come back into your funnel, into the start, and they go give their permission, and then it perpetuates. It cycles around because when they get out the other end, they recommend you. And how cool is that. See what I mean, lack of effort. I’ve built, I’ve made millions of pounds online with this system. This is not something I just made out yesterday. This is stuff that the top internet people are doing all the time. Even amazon. They don’t do it exactly, but amazon have a lot of that, and obviously not going to tell amazon how to do it, it’s a different sort of model. This is how it’s done my friend. You can do it too. Follow us and we’ll show you. It’s a lot easier than you think. And it’s free. Anyway it is time for a book for the week. And today, this is a good one to follow, it’s called ‘Build a Brand in 30 days’. Now it’s by Simon Middleton. And quite simply, it’s how to create, manage and communicate your brand profoundly and effectively, in just a 30 day period. And it’s got 30 clear exercises, so like a daily exercise, it’s great. 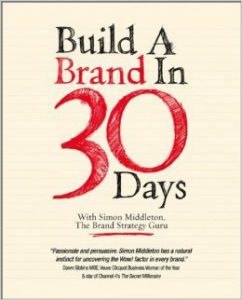 Build a brand in 30 days, you have to read it if you don’t, then you are not playing anymore. Okay. Thanks. I’ll see you tomorrow.